This summer, while Tor and Jørgen were traipsing about the countryside, I was hard at work on a spectacular conference paper. And as required in the production of works of genius, I wrote it in seclusion, hidden away from the world and its trivialities. More specifically, in the tea rooms of Clovelly. 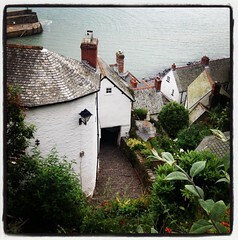 Clovelly is a village in Devon, so idyllic I half expected to be murdered within the first few hours. It has one street, no cars, two donkeys, two inns w/pubs (or possibly the other way around), about 200 people and no mobile coverage. I exaggerate. There was mobile coverage if you stood half-way out on the pier. Village on the face of a sheer cliff. placed opposite to one another, and twisting here and there and there and here, rose, like the sides of a long succession of stages of crooked ladders, and you climbed up the village or climbed down the village by the staves between: some six feet wide or so, and made of sharp irregular stones. and coal, and such other cargo as was unshipping at the pier from the dancing fleet of village boats, and from two or three little coasting traders. As the beasts of burden ascended laden, or descended light, they got so lost at intervals in the floating clouds of village smoke, that they seemed to dive down some of the village chimneys and come to the surface again far off, high above others. 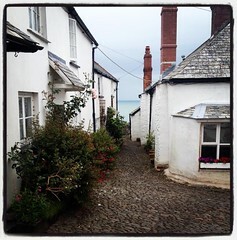 No two houses in the village were alike, in chimney, size, shape, door, window, gable, roof-tree, anything. The bit about the donkeys is no longer accurate. 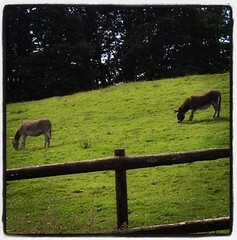 Things are now transported by a man with a sleigh (no, not that man); the donkeys eat grass and occasionally take a walk, from what I could see. Though I did not see much. As I said, I spent most of my days in the tea rooms. They are perfectly English tea rooms. Rooms for drinking tea in. No fussing about with Italian coffee drinks, thank you. Tea, served with a small jug of milk without you having to ask for it. 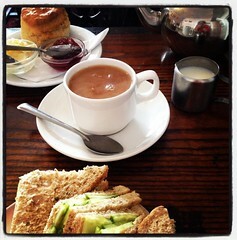 And the twin pinnacles of British cuisine: Clotted cream scones and cucumber sandwiches. If I did not love Britain for its literature, its history, its weather or its people (you know who you are), I would love it for cucumber sandwiches. And if there were no cucumber sandwiches, you would still have my heart as soon as you gave me warm scones with clotted cream and jam. With tea and milk. In the corner, there was a buzzing thing that lured flies in with a bright blue light, and electrocuted them as soon as they drew close (some kind of metaphor for academia, I suspect). It is important to set the mood when you are trying to produce a work of staggering genius. I spent my evenings in the pub. At first, I made the mistake of going to the pub at the inn where we stayed, but after having had three near heart-attacks as dogs ran past me without any apparent supervision from their owners, I realised it was a dog-friendly pub (unlike Camilla-friendly pubs, which I much prefer). 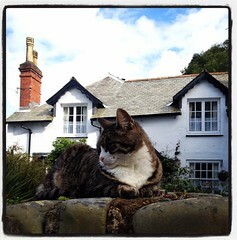 I therefore headed all the way down to the very bottom of the village, to the pub by the pier: The Red Lion. 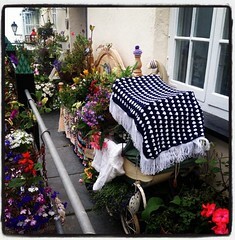 quintessentially British moment, and said some nonsense back. So far so good. A few hours later, however, she sat down at my table to talk to me. I suspect that the reason for this departure from certainly my experience of normal pub behaviour was her perception that a) I must be really, really weird, b) something must be horribly wrong, and so I must need saving. She asked me if my book was very good. I said it was all right, and she countered with the fact that I had been reading it for ages. I later learnt that Andy Murray had been playing an important match just around the corner, so her shock may have been justified. I would not have made too much note of it, had it not been remarked by others as well that I was reading in a pub. One Australian couple tried to save me from myself in the restaurant one evening. This is me: rebel, rule-breaker and anti-social deviant. The books were good, though. As were the drinks. I recommend The Red Lion if you are ever in the area. something to be said for writing about a period while being surrounded by its remnants (more here). 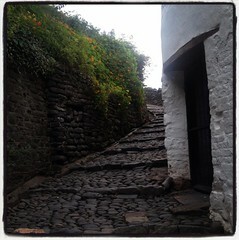 At the same time, however, Clovelly was incongruously contemporary. 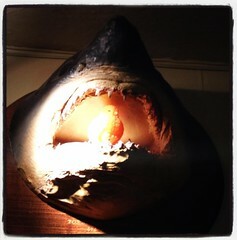 There was the sinister shark's head with the rubber duck in its jaws, but more spectacularly, there was the yarnbombing. 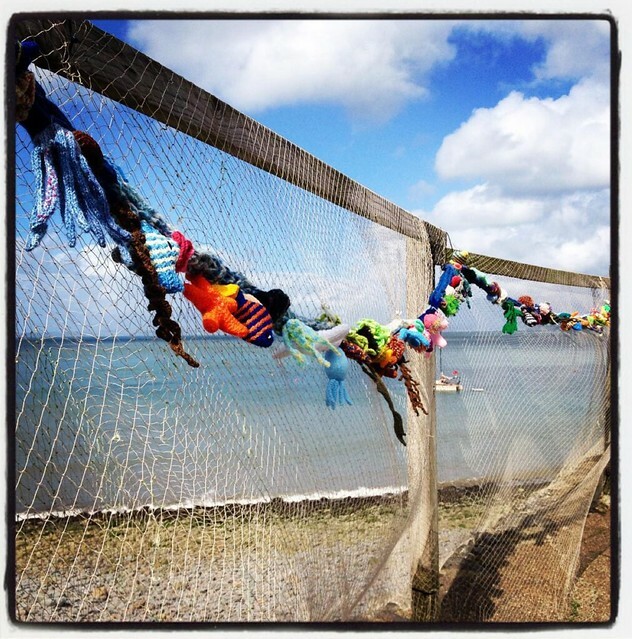 Now, I have never been a great fan of yarnbombing, much as I love knitting. It usually takes the form of covering up trees with ugly yarn (frequently neon-coloured, though the gods only know why). Here, however, there was a certain je ne sais quoi to it (though I suspect the quoi is quality). At any rate, I finished my paper, was not murdered (not even burnt as a witch for reading in pubs). 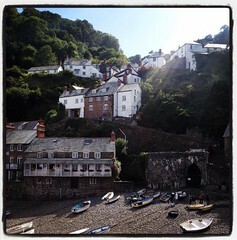 I declare Clovelly perfectly suitable for the errant academic. 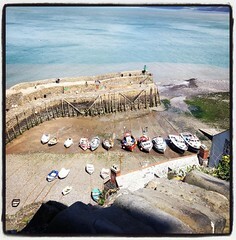 I quite liked Clovelly, even though I didn't spend as much time there. I wouldn't mind going back there at some point, to try the cucumber sandwiches if nothing else.